"Adventures in time and space ... told in future tense..." was famous narrator Norman Rose's opening to the radio show with some of radio's earliest science fiction, adapted from masters of the genre. 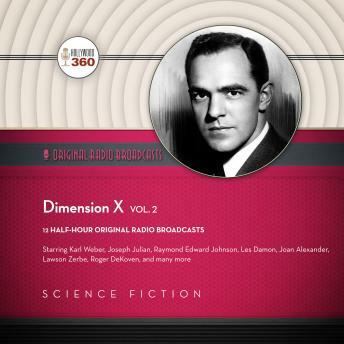 Dimension X was one of radio's first adult science-fiction series and made its mark by adapting short stories by acknowledged masters in the field, including Isaac Asimov, Clifford D. Simak, and William Tenn. Scriptwriters Ernest Kinoy and George Lefferts, who also contributed their own original scripts, adapted the original stories. At the start of every broadcast, host Norman Rose promised us "adventures in time and space, told in future tense" and you knew you were about to be transported from your everyday existence to somewhere completely different-maybe even a distant planet. Radio was a fertile medium for science fiction. It was easy to visit other planets, interact with aliens, or fly in a rocket ship simply by using your imagination. Dimension X debuted April 8, 1950 and completed its broadcast run September 29, 1951.